Expanded learning programs provide after school and summer learning opportunities to nearly 500,000 of California’s students with the greatest needs through nearly 4,500 expanded learning programs. While California is ranked number one in after school nationally, there are significant fiscal challenges and unmeet need for expanded learning opportunities. 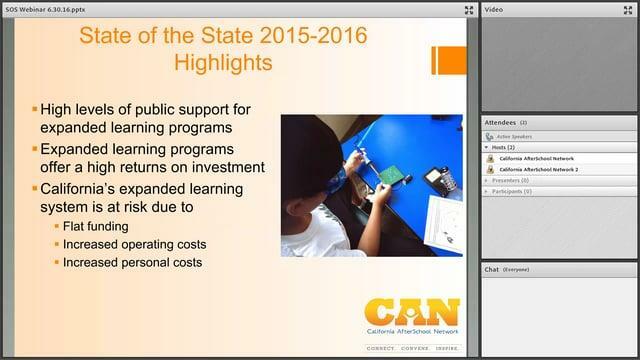 2.4 million youth in California would be enrolled in an expanded learning program if one were available to them. Since 2007, expanded learning program sites have been funded at a daily rate of $7.50 per student, per day, while the Consumer Price Index has increased by 19 percent and minimum wage has increased by 33%. Without relief, programs are being forced to reduce enrichment activities and academic supports, professional development, staff hours, and access as programs decrease the number of students served and risk closing their doors altogether. Expanded learning programs provide opportunities for learning and enrichment that narrow the achievement and opportunity gaps. Students who fully participate ASES or 21st CCLC after school program gain the equivalent of up to an extra 90 days of school. Research illustrates that regular attendance in expanded learning programs increases student achievement, attendance and positive behaviors. The report was officially released at the California Afterschool Challenge on May 9th and 10th where it was shared with members of the California Legislature along with documents outlining the state investment in the ASES program for each legislative district. The information in the document provides a great context for expanded learning in California for state leaders, district administrators, and all levels of expanded learning practitioner. The California Legislature proposed to increase the daily rate to $8.50 through both legislation and the budget. As of 6/29/16, AB 2663 (Cooper) did not advance out of the Assembly Appropriations Committee, and funding for the proposed increase to the daily rate was not included in the State’s budget for 2016-17. In the coming year, important discussions will take place in the legislature that may impact expanded learning in California. Therefore, a document such as the State of the State could be useful to inform legislators about the importance and impact of California’s expanded learning programs.